The Australian Pig Industry has gone through some very tough times recently with unfavourable conditions of high feed prices and low pig prices. A recipe for a challenging year and it certainly has been that! As with many tough times, measures need to be taken to cope with changing conditions. Diversity and adaptability have been key to driving through the fog and reaching brighter prospects. In June last year I did my budget for the year ahead. I estimated wheat and barley at A$300 per tonne. By mid-August, ‘the big dry’ drought had set in and prices had hit $400/t and were still going north! At this point pig prices were $2.20 per kg deadweight, if you were lucky. This was about $0.60 down on 12 months prior, and $1.30 on the year before that. With escalating feed prices, low pig price farmers were talking seriously about getting out, depopulating/repopulating or reducing sow numbers. The pig price is another issue. From 2015-17, prices were good to very good and pig farming was quite profitable. The industry as a whole was improving – new vaccines and management systems helped production and growth rates. Mortalities had decreased on farms and increased pigs going for slaughter, not to mention the farms that increased sow numbers! So you had a situation where there were more, and heavier, pigs on a predominantly domestic market. Wholesalers reported they had container loads of pork in chillers. A backlog existed, not only of fresh product but there was a retained frozen supply to deal with. 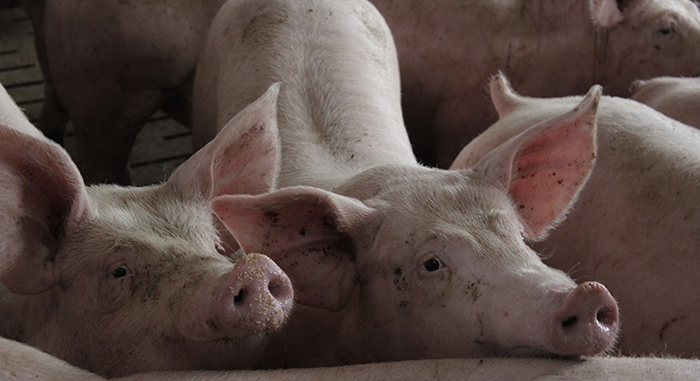 The oversupply saw pork prices plummet to new lows. The market looked gloomier than it did in 2008. The industry body, Australian Pork, ran an extended marketing/ advertising campaign at Easter to get rid of the forecast pig glut. Historically, Easter (our autumn) is a time where pigs are likely to be heavier than normal. After a hot summer, nights become cooler and feed consumption goes through the roof. With public holidays come abattoir closure days. This is a difficult time to sell pork in a normal year, and this was no normal year. Higher-than-expected rain in late-November/early-December did wonders for the struggling crops in our district. Yields were above average, but the national shortage meant prices were high and the northern states had to pay even more due to freight costs. But we got it and we can sleep at night knowing it is in the bin and we can feed 19,000 pigs! The good news is that pork prices have risen and today we are looking at $3.30/kg deadweight. The outlook is much more positive, but hopefully we won’t forget these hard times when the thought of expansion crosses our minds. Our farms are located in the Central Highlands of Victoria. There are two sites, the main one comprising 2,000 farrow-to-finish sows, a feed mill, a total waste management system and a garden products division. On the 2,000 acres owned, 2,000 composite ewes are run, plus a cropping programme comprising canola and wheat. The computerised feed mill produces 220 tonnes of prepared feed per week, utilising available by-products and the farm’s own wheat. The total waste management system converts the effluent from the piggery into power. The power not used on-site is sold to the grid. The odourless organic fertiliser is used to promote crop growth and sold commercially through the company’s garden product division. The second site is a grow out for 2,000 pigs from 12 weeks until sale at 20 weeks. There is another 340 acres here where summer forage crops are planted for fire protection and fattening feed for the ewe lambs, reared to join the main flock. The saying ‘don’t put all your eggs in one basket’ is still apt. Diversity and adaptability have been key in our company’s structure.